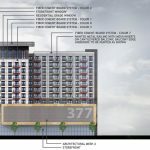 Kaplan Residential is proposing a 331-unit apartment building along Centennial Olympic Park Drive. The 12-story building is the latest boost for downtown, where hotel and residential developers and tourist attractions are clustering around the Centennial Olympic Park area. Kaplan’s nearly 3-acre site sits diagonal from the Center for Civil & Human Rights and the Georgia Aquarium. The developer wants to break ground by the end of the year or early 2017.